Awhile back, a friend said to me "I like reading your blog but I miss the days when it was more about who you are and less about what you do. I understand why it can't always be like that, but I still miss those days." And it's true. What started as a family blog/place to dump my heart thoughts has morphed into more. As our small businesses have become our job and as our family and ministry has become our life, it feels really easy to protect what is our life and blog about what is my job. Life feels sacred, the good and the bad of it. The car rides with kids pinching each other and babies crying in the night. Cuddle sessions on Sunday afternoon and moments curled up next to my husband as we pray and share our fears. Sometimes the fuller life gets, the more I want to hide it from the internet. BUT. I don't want to look back on this blog and not remember what our family was like. One of the biggest blessings of having blogged for 9 years is that I can look back and remember. So today, I thought I'd just give a quick family update - a story of us, who we are right now, from my perspective. Nick: Our patriarch is leading us well. He's following Jesus and we're following him. Nick is full time working for the church now and handed almost all of his responsibilities with Naptime Diaries to Jacey and I. He still primarily works from home, which is a straight up blessing to me. He spends his days studying and praying, meeting with new church members, meeting with other people in our city, serving at our kid's school, and planning and strategizing for the church. I surprised him with a bike for Christmas (which was the hardest thing in America to surprise someone with) and he's started riding a good bit. For fun, he works out and occasionally watches sports. For fun, I tell him he needs to have more fun. Elias: Elias turned seven at the end of January and most days I'm not sure who is parenting who. Ebug wakes up faithfully at six every morning, so him and I get to spend that first hour together - squished together on the couch as I read the Bible and he plays with legos or reads a book. His heart is in such a cool place right now, as he's all of a sudden exposed to the world in so many new ways - but he wants to be tethered home too. He reads his Bible every night in bed and he does a wicked english accent. He loves legos and anything electronic. His hair is so thick and beautiful, I feel like it must hurt his head. Glory: Glor just turned six last week and I swear in my head, she is still 4. Maybe 5. Not 6. The only word to describe her is JOY. She is so full of joy. And even when she's not, when she's mad or fussy, she makes us feel joyful because she's so stinking cute. She serves her heart out - often asking multiple times a day, "Is there anything else I can do?". She loves Frozen like every other little girl in America right now. She likes Irish dancing, which is hilarious to watch. She gets dirty quicker than anyone I've ever met and her smile is infectious. Benjamin: Oh Benj, son of my right hand. We've seen more growth in Benjamin in the last year than I ever could have imagined. He is growing so soft, but he's still so unlike the rest of us in some funny ways. He's grumpy and sarcastic, isn't quick to show his emotions, and he is really, really, really genuinely funny. One of my favorite moments of 2014 was a month or so ago and he was going to sleep. He still sleeps with his same camo blanket that he's had since he was six months old, even though it barely covers him. I couldn't find his blanket anywhere and he was slowly becoming distraught. I finally found it and after I covered him up and as I walked away, he called my name. I looked back over my shoulder to see him beaming the biggest smile, with his arms outstretch, wanting a hug. It was so, so loving for him and I stored it in my heart. Cannon: Cannon, Cannon, Cannon. What can be said of the baby that has me wrapped around his finger? His dad & siblings too. Cannon JUST started consistently sleeping through the night about a month ago, at 13 months old. He still has off nights. He is crazy strong willed and loud like no other. He loves playing ball - a yellow tennis ball is like his girlfriend. He loves waffles and blueberry cereal bars. He's starting to say a few words occasionally - uh oh, Dada, the occasional "no", he says "yeah!" all day long. He likes staring out the front door and watching the neighborhood cats and he went from walking to running in about one day. I still hold him like a baby once or twice a day and man, I am so grateful for him. Me? My days are norming out more than they ever have in my adult life. Busy weeks and slow weeks are starting to all look the same. I wake up early to be with the Lord and Elias. I get the kids ready for school and then stare into space for a few minutes when Nick takes them. I start really working around 8am and work pretty hard till noon every day while Cannon plays, naps, or I have a nanny. The rest of the afternoon is a flurry of errands, cleaning, Cannon, a little bit of work, picking up kids, neighbors over, working out, cooking, and cleaning some more. I love weekly date nights with my husband, our new church and these amazing relationships I'm developing. I'm completely humbled and feel like I have so much growing to do in my three biggest passions - motherhood, the church, and health + fitness. I keep a candle lit almost all day, I finally found the perfect lipstick for me and I rewear my outfits a few days in a row. It's not perfect, but man are we blessed. This is who we are because He is who He is. categories: "evidences of grace", "family", "life", "our family"
Hey guys, below is a guest post from a gal who has my heart. Meet Lauren, a blogger and mama who has lived through some serious heartache. I'm so grateful to have her sharing on this day specifically & she'll get to tell you why. Today is a very special day for our family. Today is Trisomy 18 Awareness Day. March 18th marks this special day because the date represents what Trisomy 18 is. The date of 3/18, describes this syndrome because Trisomy 18 means there are 3 of the 18th chromosome. Before 2013, I never thought about trisomies or genetic disorders. Ever. I took a genetics class in college and remember learning about trisomies and other genetic syndromes. I remember learning about Trisomy 21, or Down Syndrome, and thinking that it would be hard to have a child with it. Then I vaguely remember learning about a few genetic disorders and my professor off-hand saying they were bad news and always fatal. I ever so vaguely remember thinking how awful that is and that would be the worst. Never thought about it again after my sophomore year of college. Until last year. Trisomy 18 [T18], also known as Edwards Syndrome, is the presence of an extra 18th chromosome, and it is a fatal chromosomal syndrome. Our second son, Gabriel, had T18. And that is why I am sharing about the syndrome on this day. I want to raise awareness of T18, but mostly, I just want to share our Gabriel's story. It's a powerful story and one worthy of sharing. One that is laced with God's power, His will, His love, His grace, and how He redeems. Our lives are being transformed from ashes into beauty because of the work God is doing in our lives through our precious baby. Here's a little more of our story. I was 20 weeks pregnant with our second child, and we were really excited to find out the gender - hoping for another boy! My husband and I went to that appointment which started normal. It got awkward but I didn't think too much about it until the ultrasound tech told us there were some problems. The OB who we had never seen before, and never saw again, was caught by surprise by what he was seeing. He told us there were problems with the heart, brain, and stomach, and they thought there was for sure some Down's Syndrome in there. When we asked him how bad it was, he told us we should consider terminating. We never considered it. The next day we saw the perinatologists and genetic counselor who told us after a two and half hour ultrasound that they thought our baby had Trisomy 18. We didn't know what it was. When I told the genetic counselor I had never heard of it, she said "that's because it's known as the fatal syndrome." With those words, we broke down. How could our baby die? It made no sense and hit us harder than we've ever been hit. We went home to process it. We shared the news and decided to share our story with others. And the work God did through our precious baby G was and continues to be amazing. Our lives have been forever changed. We are a family of 4 with only 3 of us here together. We are a broken family who misses our 4th Morgan. We are a family who visits the cemetery all the time, appreciating the beauty in our picture of brokenness. We are a family who talks about death and loss and Heaven with our two year old frequently. We are also a family who is being healed by our Healer. A family who has seen glimpses of God that we could never have imagined seeing. A family who has been bathed in grace. While losing our son has been the worst part of our lives, being his parents has been the richest blessing. Our sweet G has touched more lives and spread God's message of hope further than my husband or I ever could have. Walking through 2013 was horrible, but it was also a privilege. So on this day, I want to encourage you. If you are a woman who has experienced a loss -- a miscarriage, perinatal, or infant loss -- know that you are not alone. Know that you are loved and that there are other women who have walked this path and survived it. Know that God walks each step with you. And above all, I pray you know the hope that we have in Christ, for it is what fuels us to face each back-breaking day. If you or someone you know can relate to this, I would love to connect! Please let's talk and share the bond we have. If you are a woman who wants to know how to support a friend through this -- be there. Love on them, do things for them without them asking. Just show up. And if you are a woman who has never experienced this before, thank you for reading my story. Jessi, thank you so much for allowing me to be in your space today to share what is the deepest passion in my heart. Your love and support to me over the past year has been remarkable, and I am always thankful for you! Are you like me? Creative, but messy? Intentional but far from meticulous? This is the first in a series of posts for women that want to do inspiring DIY projects that actually work and help your life. You won't find any hand painted jewelry boxes here that look amazing in the pictures and awful on your nightstand. Hang out with us here as we make intentional and awesome projects with imperfect hands and skills. I've got awkward hands and a bad back. Why does crafting seem to hurt your back so bad? All the bending and leaning over something, yeesh. At the top of my craft-hatred list is scrapbooking. I once had a friend who scrapbooked like it was her j-o-b and I learned quickly by watching her that I just couldn't be a crafter. The stickers, the meticulous cutting and laying out of the pictures, the piles and piles of memories and the sticky paper. I am a messy and creative being, I don't have a meticulous or cautious bone in my body. Now, that was like seven years ago, and I know that scrapbooking has evolved. I love watching women do the project life stuff and photobooks have taken us so far. It's no longer the preset photo pages with comic sans font captions - we have so many options! There is artifact uprising, even shutterfly & blurb. BUT - It's gotten to a desperate point in our home and we have NO photo books. We have one small one from our wedding, but nothing else. I knew I could order from one of the aforementioned sites, but I found myself at the end of 2013 with an intense desire to get my hands dirty and tell our story. Step 1. I downloaded the Walgreens app on my phone and praised the Lord that I'm a habitual instagrammer. When you download the Walgreens app on an iPhone, it connects with your instagram and connects all your pictures. You can go through your entire feed and order the ones you want - for .39 a piece. I took about ten minutes while I was feeding Cannon a bottle and selected the hundred or so pictures I loved the most from my 2013 instagram feed. Thirty minutes later, I picked those bad boys up at Walgreens! Woohoo! Step 2: On the way home from Walgreens, I ran by the craft store and got a cute turquoise leather scrapbook on sale, some blank white paper, and scrapbook pages. I also picked up two rolls of washi tape and some project life small sheets of paper. Step 3: When my kiddos went to bed that night, I spread out all my 2013 printed instas and lined them up. I arranged them in order of when they were taken and then wrote a short note or memory regarding that day, month, season. I applied all the pictures with washi tape and the same for the notes. It wasn't about perfection or excellence, it was about getting it done. A few hours and several cups of coffee later, I had my first and favorite scrapbook. It was quick and dirty, but it was ours. I have to say, this little project may have redeemed crafting for me. I love the idea that my kids can now look over this past year (forever and ever!) and hear my voice and see what my hands made. And for me? The project was SO good for my heart. When I laid out the pictures, I didn't remember headaches or hard days - I was just so stinking grateful for all that the Lord had done. And it inspired me to take more pictures, make more memories, fill this year's book from front to back with pictures and thoughts. What about you? Are you a crafter? A scrapbooker? Could you use some more inspiring projects for imperfect women? 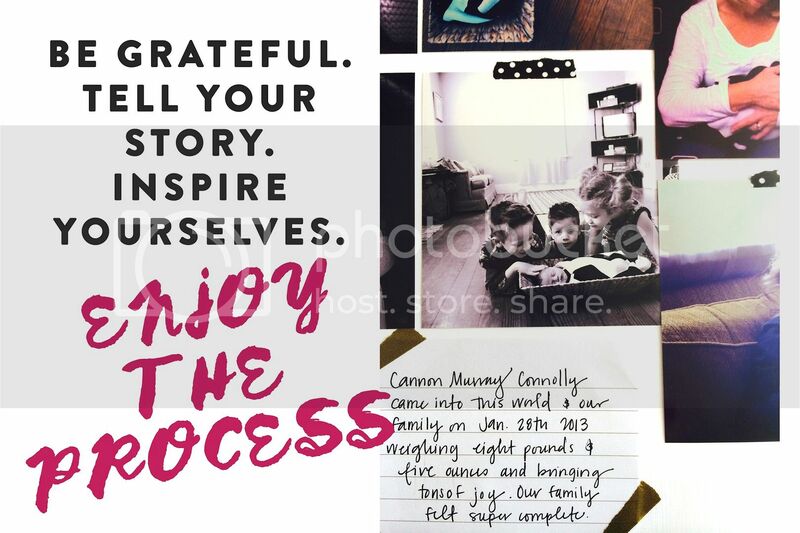 categories: "2014", "family", "inspiration", "inspiring projects"
So you want to print your custom photo cards? It's that amazing and also slightly stressful-for-families time of the year! I love when we get to the sweet spot in mid-December where there are a few Christmas cards coming each day! When I was little, my mom and I would pour through the mail together and I have so many sweet memories of sitting on the steps and staring at all the cards. Reading every single family update & enjoying the faces of families and friends we hadn't seen for awhile. No wonder designing other people's cards is one of my favorite "jobs" I get to do all year! Ever since we began designing custom Christmas cards, I get so many questions about where is the best place to have the cards printed and how much of an investment is this little tradition actually going to cost us. I totally get it! I've put together a little post to help you see some of the most cost efficient ways to print your own custom cards! Jacey, our shop assistant, had samples made from all of the printing resources I list here and those are the photos shown below! We promise we wouldn't suggest somewhere if the quality wasn't great. And if you need a beautiful custom card to print - we obviously known somewhere that has plenty to choose from! 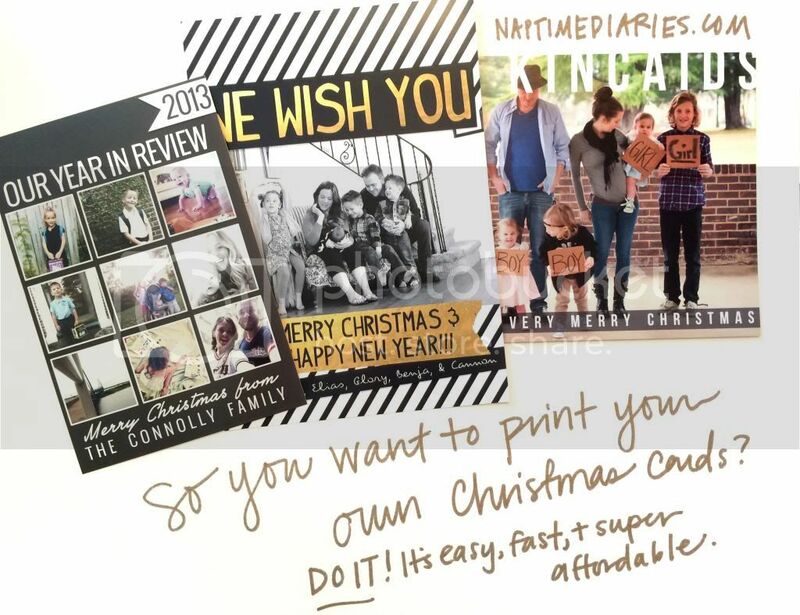 We have 15 customizable Christmas card designs in our shop for you to check out! Here are the simple steps to getting your photo cards printed! 1. Order one of our 15 customizable photo cards. Our team will email you within 24 hours to get all your info & photos, then we'll have your high resolution image back to you in 3 business days! 2. Pick a printer. We're sharing details on our three favorites below. Snapfish, Office Depot, & Walmart! 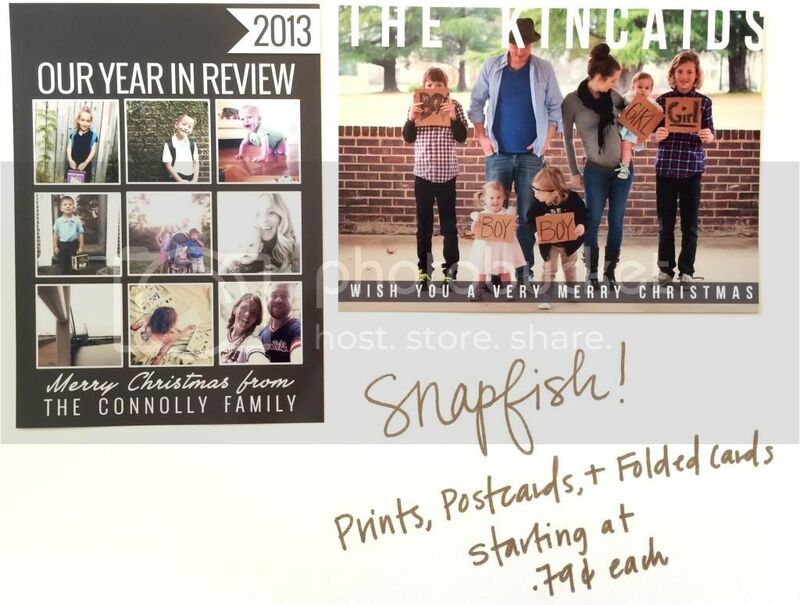 Snapfish is my favorite place to get Christmas cards printed and where I always get our holiday cards done! There are a few different options depending on your budget and card desires! Our 5x7 cards can be printed as normal prints (we suggest matte paper), folded greeting cards, or my personal favorite - postcards! I love sending postcards for a few different reasons: a) no need to buy envelopes b) they'll include your return address on the postcard - one less thing to write! and c) the stamps are cheaper! Snapfish makes amazing postcards for about a dollar per card. If you watch pretty closely, they're always offering some sort of amazing sale so I usually just get my card ready and then wait till they have 20-30% off! The postcards come quickly and look amazing, so then all I have to do is write in addresses and send! 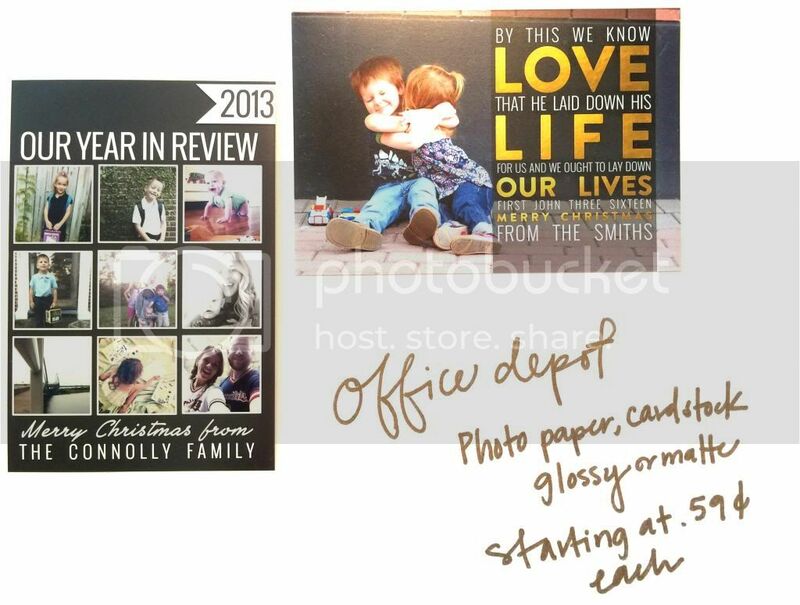 People rarely know that you can holiday cards printed at Office Depot, but you TOTALLY can and they look awesome! You can have them printed on glossy card stock or matte/glossy photo paper. If I were going to use Office Depot, I'd go with a glossy or high quality card stock so that I could write on the back! Also, they always have an awesome selection of envelopes, so it would be an easy one-stop option! Prices vary at most Office Depot locations, but you can usually get the cards printed on cardstock beginning around .59 each. The best part is, the Office Depot folks are usually more than wiling to try a few different options and see what you like best! Lastly - good old trusty Walmart is usually a good resource. 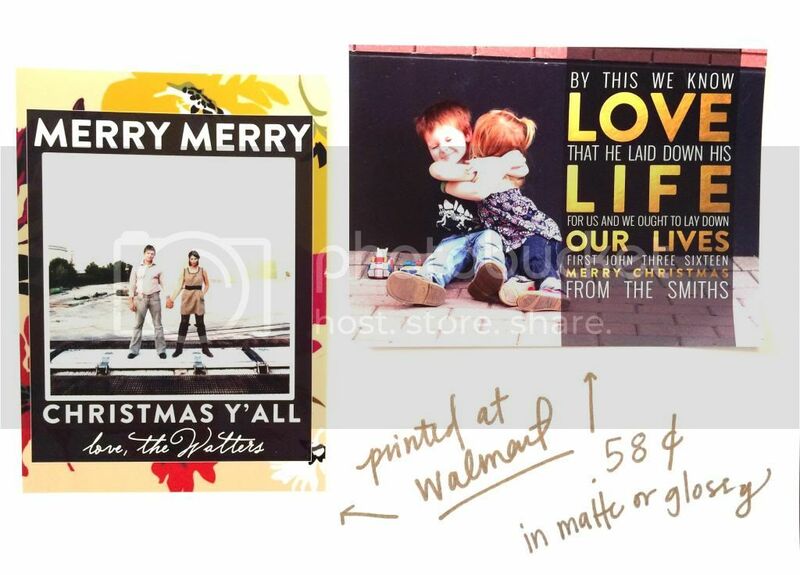 We printed these by uploading them on to Walmart.com and having them done on matte photo paper. They're the cheapest of all the options and not necessarily the most luxurious quality - but always good in a pinch! These are awesome if you want to include them with a letter or just send your photo + well wishes out to your people! 3. Lastly, wait for your cards to arrive and send those puppies out! Woohoo, you did it! And now you don't have to worry about the dreaded get-dropped-from-peoples-Christmas-card-lists-because-you-didn't-send-them-one issue! If you're hoping for a Naptime Diaries Christmas card, NOW is the time to order. As the holidays approach and we get busier, our Christmas card prices increase so we highly suggest you buy them this week when they're only $15!